1. Cold rolled or machine steel, brass, and soft metals - 136 strokes per minute. 2. Alloy steel, annealed tool steel, and cast iron-90 strokes per minute. 3. High-speed steel, unannealed tool steel, and stainless steel - 60 strokes per minute. Cast iron should be cut entirely dry, but a coolant should be used for cutting all other materials. A suitable coolant for cutting most metals is a solution of water and enough soluble oil to make the solution white. The coolant not only prevents overheating of the blade and stock but also serves to increase the cutting rate. Place the workpiece in the clamping device, adjusting it so the cutting-off mark is in line with the blade. Turn the vise lever to clamp on the material in place, being sure that the material is held tightly, and then set the stroke adjustment. Ensure the blade is not touching the workpiece when you start the machine. Blades are often broken when this rule is not followed. Feed the b] blade slowly into the work, and adjust the coolant nozzle so it directs the fluid over the saw blade. NOTE: Safety precautions to be observed while operating this tool are posted in the shop. READ and OBSERVE them! Many sizes and styles of drilling machines or DRILL PRESSES are in use today-each designed for a particular type of work. Only the drill presses not covered in Tools and Their Uses, NAVEDTRA 10085-B2, are discussed here. 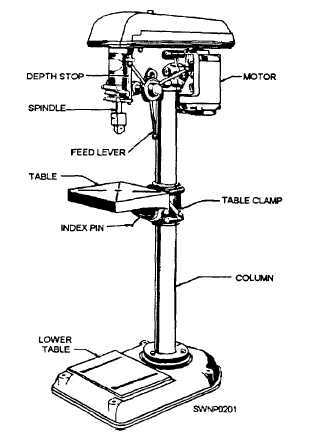 One type of upright drill press is the SENSITIVE DRILL PRESS (fig. 12-15). This drill is used for drilling small holes in work under conditions where the operator must "feel" what the cutting tool is doing. The drill bit is fed into the work by a very simple device - a lever. These drill presses are nearly always belt driven because the vibration caused by gearing would be undesirable. Figure 12-15. - Sensitive drill press. The RADIAL DRILL PRESS (fig. 12-16) has a movable spindle that can be adjusted to the work. This type of machine is convenient to use on large and heavy work or where many holes are to be drilled since the work does not have to be readjusted for each hole. Check occasionally to make sure that all locking handles are tight and that the V-belt is not slipping. Before operating any drill press, visually inspect the drill press to determine if all parts are in the proper place, secure, and in good operating condition. Check all assemblies, such as the motor, the head, the pulleys, and the bench, for loose mountings. Check the adjustment of the V-belt and adjust as necessary according to the manufacturer's manual. Make sure that the electric cord is securely connected and that the insulation is not damaged, chafed, or cracked. While the drill press is operating, be alert for any sounds that may be signs of trouble, such as squeaks or unusual noises. Report any unusual or unsatisfactory performance to the petty officer in charge of the shop.